The Super Soaker XP 150 is the first, highly prized heavy assault water blaster. 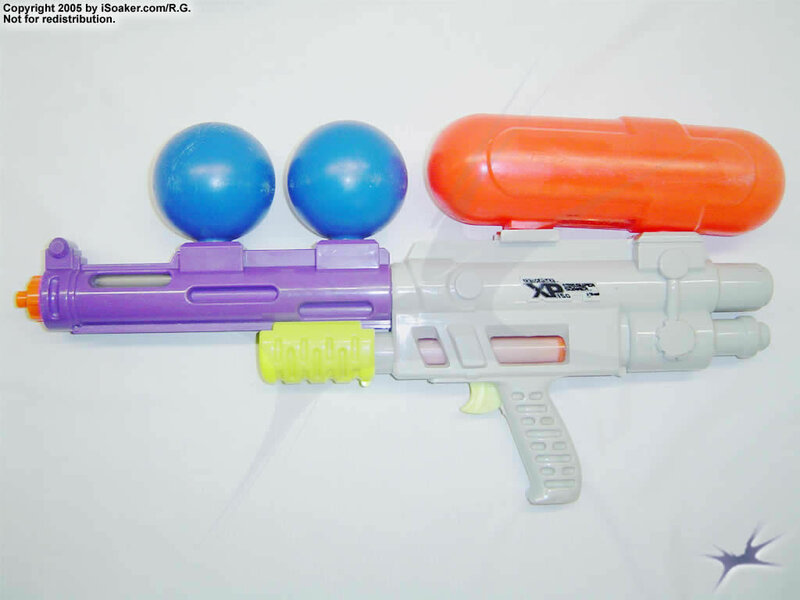 Though one of the best weapons of its time, a fully functional Super Soaker XP 150 is unavailable for review; the one in our current holdings has been well used and, while functional, does not appear to be performing as well as it likely did when new. However, it is believed that the Super Soaker XP 150: Classic Series behaves like the original. The Super Soaker XP 150 was made by Larami in 1994 as part of the 1st Gen XP line which was replacing the Classic line. It was the middle of the line, as it was bigger than the 55, 75, and 95 but was smaller than the 250 and 300. Many consider it to be the best XP ever. The biggest strength of the XP 150 is the large pressure chambers and massive pump volume. If you hold down the trigger while pumping, more water goes into the PC than out the nozzle. Or, you can let loose several tap shots or a long burst, and recharge again within 1-5 pumps. Don't be counting on a 150 user to be pumping a whole lot. Now, onto the rest of the gun. Range is about 35 feet, which is pretty average. Output is 2X, which is also pretty average. Capacity is also average, or maybe even a little below average. The 150 uses its' water up pretty quickly. Speaking of capacity, the 150 also has a screw on tank. Many people consider this a con, because, yes, it is slower to refill and harder to fill up on the go. BUT if your like me and you have one functioning XP 150 and two tanks for it, you could mod the tanks with a screw on cap for each one. This way, you can carry around multiple tank in your backpack. When you run out of water, simply take off one tank and screw on the other. Pretty nifty in my opinion. One last thing, the XP 150 has a riot blast. Simply screw off the nozzle and you have yourself a 15X shotgun blast. But only do this if you really have a grudge on your enemy, because your entire PC will be used in this 1 second blast of soakage. Range is pretty terrible here too, but it is fun to use nonetheless. The XP 150 IS durable, but it really depends on how it was taken care. My first two 150's had rough lives, and never really had a chance. My current 150 is in much better shape and should hopefully last a while. My current XP 150 has leaks or any other problems despite the fact it is older than I am. Overall, the XP 150 is an excellent addition to any soaker armory, and can fill almost any roll at a war except those occupied by the large CPS cannons. If you have the chance, pick one up. The XP150:Original and the XP150:Classic are basically the same other then their color. The XP150:Original is a good super soaker with okay range, average firing rate, and low capacity (To me), but high power for the time it was made. One hardly has to pump 5 times to make a solid blast! Its size makes it very easy to carry around, but because of its low water supply, you should probably bring along a side-arm on missions far away from a water source. It also takes a while to fill up the blaster since you have to twist off the tank. It makes a good blaster for medium battles. Of course, like all other XPs, one should stay away from people owning a CPS or MONSTER. PROS: Small size, high power for it's time, and hardly any pumps make this blaster a good one to use. CONS: Low capacity, the annoying twist off refilling sequence, and fire rate are all not the best on the XP150:Original.